Jonathan WILMARTH (1656 – 1733) was Alex’s 9th Great Grandfather, one of 1,024 in this generation of the Shaw line. Jonathan Wilmarth was born in 1656 in Rehoboth, Mass. His parents were Thomas WILMARTH and Elizabeth BLISS. He married Esther PECK on 29 Dec 1680 in Rehoboth, Mass. Jonathan died in 1733 in Rehoboth, Mass. Esther Peck was born 7 Jan 1657/58 in Rehoboth, Mass. Her parents were John PECK and Elizabeth HUNTING. Some sources say Esther died in 1756 in Rehoboth, Bristol, Mass. 20 Apr 1728 Attleborough, Mass. 16 Jan 1741/42 – Rehoboth, Bristol, Mass 27 Apr 1765 Attleborough, Mass. The Wilmarths had substantial land holdings in the Palmer River area of Rehoboth, some properties adjacent to Fuller holdings. Rehoboth of today has a street named Wilmarth Bridge Road, running from the turnpike, (Route 44), to Summer Street, and passing through what was once Wilmarth property. Esther’s husband William Dryer was born 28 Nov 1684 in Taunton, England. His parents were William Dryer and Anna Locke. He immigrated in 1704. William died 18 Dec 1784 in Rehoboth, Mass(came in 1704) D. 100 YRS OLD. i. Esther Dryer b. 29 Apr 1712; m. Nathan Cobb July 05, 1742.
ii. Elizabeth Dryer , b. 13 May 1714; d. 31 Mar 1715.
iii. Elizabeth Dryer , b. 31 Dec 1717; m.19 Nov 1742 in Voluntown, CT to Benjamin Pierce. John Dryer was a minute man in Rehoboth who enlisted after hearing the news from Lexington and Concord. He served until the War was over despite his age of being over 50 years old. Margaret’s husband Nathaniel Bosworth was born 1694 in Rehoboth, Bristol, Mass. His parents were Joseph Bosworth and Esther Smith. Nathaniel died 30 May 1772. Biographies of Nathaniel Bosworth show his wife as Margaret William, but this was later proven to be Margaret Wilmarth. Oct. 11, 1715,- Nathaniel with his brother Joseph bought 65 acres of land in Rehoboth for £260, of Stephen Hunt; deed signed by Stephen and Damaris his wife. Apr. 13, 1725, Nathaniel’s brother Joseph, in consideration of an agreement made between them relating to the estate of “our Father Joseph Bosworth late of said Rehoboth Deceased,” deeded twelve acres of land “scituate at the south end of the farm whereon I now dwell in the Township of Rehoboth . . . bounded southerly by Ebenezer Peck’s land, Easterly by a highway, northerly by my own Land and westerly by a highway.” On Apr. 14, 1725, the same day that Nathaniel sold his brother his half of the 65 acres, he also sold him the above mentioned twelve acres. This deed, which was witnessed by Israel and Stephen Peck, is in the possession of Mrs. Carrie Bosworth Reed. Feb. 12, 1727/28 – Nathaniel sold five acres of swamp land to John Hill of Rehoboth. (Taunton Deeds, Bk. 18, p. 67). On the Old Proprietary Records of Rehoboth (Bk. 3, p. 62 ) is given “The Records of the lands of Joseph and Nathaniel Bozworth, dated, Apr. 3, 1735.
iv. Sarah Bosworth, b. 16 Aug 1720, Rehoboth, Bristol, MA; m. Joseph Allen, Jr.
vii. Stephen Bosworth, b. 27 Sep 1722, Rehoboth, Bristol, MA; m. Abigail Wood. Stephen’s wife Deborah Crossman was born 11 Feb 1700 in Taunton, Bristol, Mass. Her parents were John Crossman (1654 – 1731) and Joanna Thayer (1665 – 1734) Many sources state she died in 1800, but there are no details to support the claim she was a Centenarian. Not only that, but Stephen married Hannah Read 16 Jan 1741/42 in Rehoboth, Bristol, Mass. Stephen’s name is often spelled Willmarth (with two ls). i. Stephen Wilmarth b. Aft 1728 in Attleboro, Bristol, MA. ii. Deborah Wilmarth b. ~ 1730 in Attleboro, Bristol, MA. iii. Elisha Wilmarth b. 25 Aug 1733 in Attleboro in Attleboro, Bristol, Mass; m int. 28 Apr 1764 in Attleboro, Bristol, Mass to his cousin Sarah Walker (2 Sep 1735 in Clarendon, Rutland, Vermont; d. New York) Her parents were Daniel Walker and Mary Perry. Her grandparents were Jasiel PERRY and Rebecca Peck WILLMARTH. Elisha and Sarah had five children born between 1765 and 1775.
iv. Sarah Wilmarth was born AFT 1740 in Attleboro, Bristol, MA. 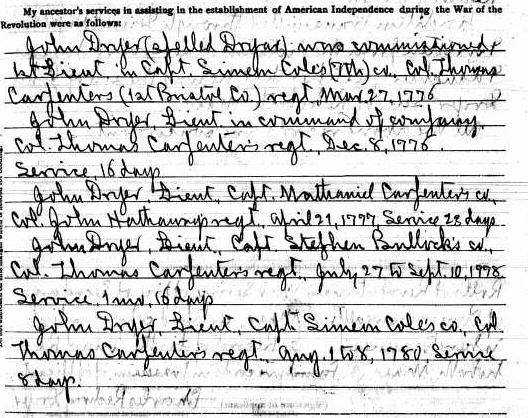 Thomas’ wife Lydia Carpenter (James Carpenter 5, Samuel Carpenter 4, William Carpenter3, William CARPENTER2, William CARPENTER1) was born 30 Apr 1700. Her parents were James Carpenter and Grace Palmer. i. Lydia Wilmarth bapt. 24 NOV 1722 in Rehoboth, Bristol, MA, and died 17 OCT 1745 in Rehoboth, Bristol, MA. She married Ezra Brown 3 APR 1745 in Rehoboth, Bristol, MA, son of William Brown and Elizabeth [–?–]. He was born 18 AUG 1722 in Rehoboth, Bristol, MA. ii. Timothy Wilmarth b. 8 NOV 1725 in Rehoboth, Bristol, MA. iii. James Wilmarth was born 16 OCT 1727 in Rehoboth, Bristol, MA. iv. Ezra Wilmarth b. 8 APR 1730 in Rehoboth, Bristol, MA.d. 1814 in brd N. Rehobeth Cem. ; m. 25 Oct 1750 to Prudence Morse. v. Nehemiah Wilmarth b. 18 MAR 1732/3 in Rehoboth, Bristol, MA. ; m. Mary Barstow 28 MAY 1761 in Rehoboth, Bristol, MA. She was born ABT 1740.
vi. Valentine Wilmarth b. 20 DEC 1736 in Rehoboth, Bristol, MA. vii. Nathaniel Wilmarth b. 27 NOV 1741 in Rehoboth, Bristol, MA. Nathan’s first wife Mary Stacy was born 1701 in Attleborough, Bristol, Mass. Mary died in 1743. Nathan’s second wife Rebecca Brown (William Brown 5, Samuel Brown4, James Brown3, James Brown2, John BROWNE1) was born 17 Apr 1725 in Rehoboth, Bristol, Mass. Her parents were William Brown and Elizabeth [__?__]. Rebecca died in Rehoboth, Bristol, Mass. “Will of Nathan Willmarth of Attl., yeoman, ‘being Sensible that I must Shortly die though at present in Comfortable health,’ dtd. 13 March 1764, prob. 8 Apr. 1766. ‘To my dear wife’ [not named], who is also to get ‘all that She Brought with her.’ Sons: Nathan, Elkanah & John. ‘To Jemima Perry the wife of Ezra I confirm What I have Given her Mother my daughter Esther [prob. dcd.] hopeing her father will make it good to her.’ ‘To Molly my Son Nathans Daughter.’ Son Elkanah to be exec. Witns: Amos Brown, Josiah Carpenter & Daniel Willmarth [19:399/400/1]. vi. John Wilmarth b: 10 MAY 1733 in Attleboro, Bristol, MA; m. 28 Feb 1761 in Attleboro, Massa to Phebe Briggs b. 8 Apr 1740 in Rehoboth, Bristol, Mass. vii. Mercy Willmarth b. 5 Nov 1760 in Attleboro, Bristol, Mass; m. 24 Jun 1783 to Thomas French b. 18 Feb 1749/50 Attleboro His parents were Thomas FRENCH Jr and Keziah PERRY. This entry was posted in 11th Generation, 90+, Historical Site, Line - Shaw, Place Names, Veteran and tagged Apr 19 1775 - Minuteman, Centenarian, Col. John Hathaway's Regiment, Col. Thomas Carpenter's Regiment, Great Swamp Fight, Rehoboth. Bookmark the permalink.